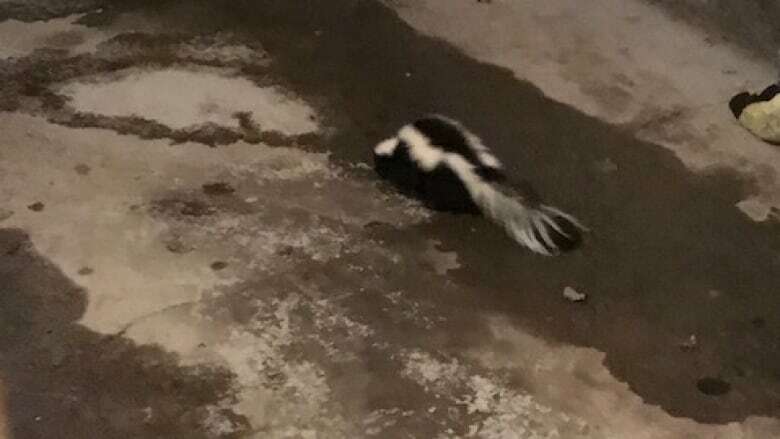 Suni Dunn has lived in Prince George for 33 years and had never seen a skunk — until a wily one decided to get comfortable in her garage earlier this week. The unwelcome roommate moved in when Dunn got back home Monday evening around 5 p.m.
"I saw black and white fur just entering my garage," she said. "I quickly tried to close the garage door thinking that the sound of the garage door would startle the animal." "I poked my head down to look under the vehicle, and there it was. Not under the vehicle, but just outside the tire on the driver's side," she told Daybreak North host Carolina de Ryk. She wanted to get the skunk out without scaring it enough that it would spray. "I tried to open up a can of tuna and I had looked in the cupboard and found some smoked oysters and I placed them outside." But Dunn thinks the seafood treats placed outside couldn't overpower the lure of crab shells in her garbage from a family dinner over the weekend. "I tried banging on my door. I was kicking my door right by the garage. I had an empty milk jug I was banging on the wall above the stairs... It never even budged." Dunn then tried vacuuming near the skunk, shining a bright light at it, and even made a cayenne solution to repel it. She also took to Facebook to try and solicit advice from strangers, but nothing worked. In fact, the skunk fell asleep, she said. "Eventually I did get into my vehicle, started it up and the skunk just looked at me and then tucked its head into its body and curled up." At around 8 p.m. the animal finally started to inch toward the door. "He makes it to right where the garage door would close, and he kind of puts his front feet out a bit and then puts them back." The skunk scurried back into the garage and hid under their shelves, out of sight. Eventually, Dunn and her husband gave up and left the garage door partly open for the night. In the morning, she said they saw footprints leading from their garage to the street. Conservation officer Eamon McArthur said it's rare they get phone calls about skunks in the Prince George area, but they will assist people if they need help with one. "It's a task in itself, because if stressed, [a skunk] could spray you," he said. The technique for moving a skunk depends on the scenario, added McArthur. The first approach is to lure it out, but another option for conservation officers is to set a live trap and relocate the animal. McArthur said if people need assistance they can call the Report All Poachers and Polluters hotline at 1-877-952-7277. It's a province-wide, 24-hour call centre that can be used for any wildlife-related issues. 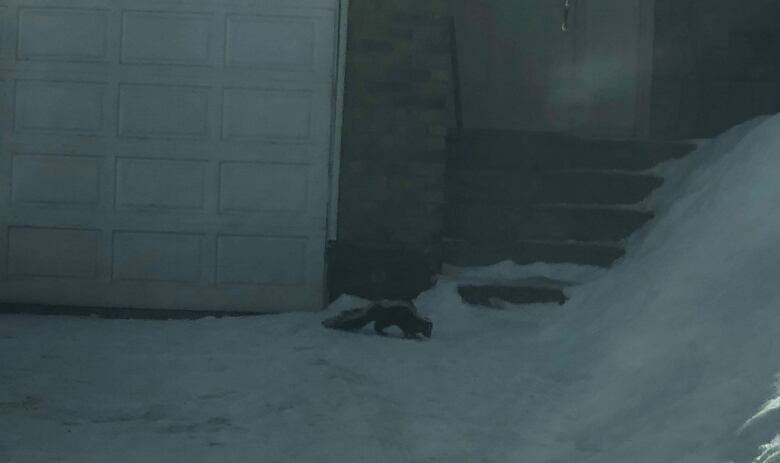 As for the Dunns' skunk, he's still apparently quite happy in the neighbourhood — the animal was last spotted on Wednesday afternoon outside a neighbour's house.